His and Hers embroidered pure cotton tote bags perfect for the beach or weekends away. His and Hers embroidered pure cotton tote bags perfect for the beach or weekends away. Each bag measures 30x40cm with a 9cm gusset, the bags are made from 100% cotton and have a flat base and gusset edge for extra holding capacity. 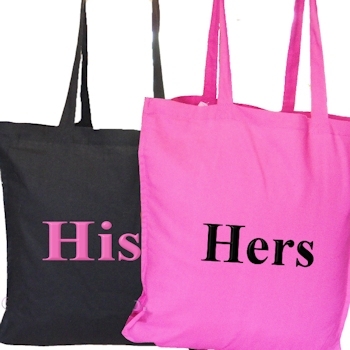 Stylish colours in black and hot pink, these bags can be personalised with His and Hers, Mr and Mrs, first names, nicknames, large initials or any text of your choice. Our sample picture shows alternating thread colurs in Print style lettering. Our sample picture shows alternating thread colurs in Print style lettering. Please allow at least 48 hours for us to embroider your customised tote bags.